The first Tolkien movie trilogy, part 1: The Hobbit (1977) | 'TAIN'T THE MEAT… IT'S THE HUMANITY! Before director Peter Jackson’s hugely successful adaption of The Lord of The Rings, and his equally ambitious interpretation of The Hobbit, there were other attempts to bring the world of JRR Tolkien’s Middle-earth to the screen. 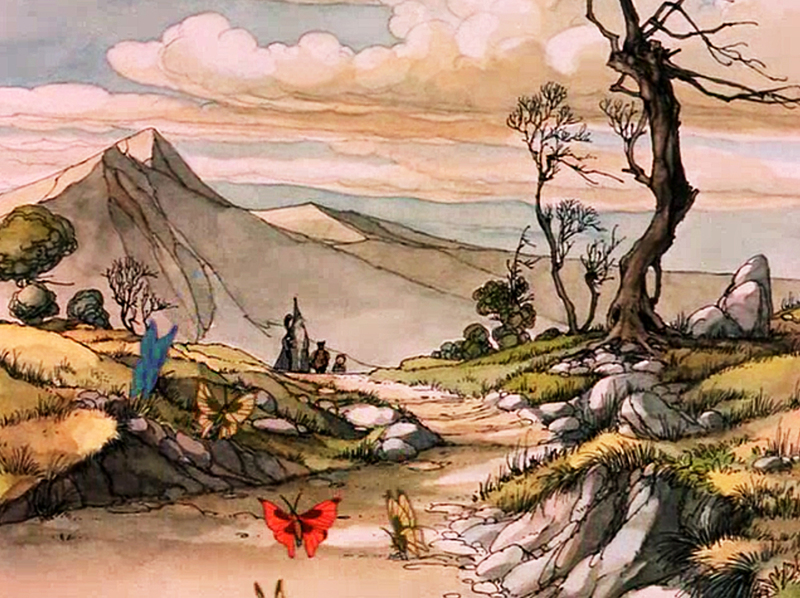 Three animated adaptions in particular formed their own Tolkien trilogy of sorts, beginning with The Hobbit in 1977. Produced by the animation team of Arthur Rankin, Jr and Jules Bass who for years had produced popular animated TV specials such as Rudolph the Red-Nosed Reindeer (1964), Frosty the Snowman (1969) and The Easter Bunny Is Comin’ to Town (1977), under the company title of Rankin/Bass Productions. The film was produced and directed by the duo with Rankin also acting as production designer and Bass provided song lyrics for the film’s main theme. 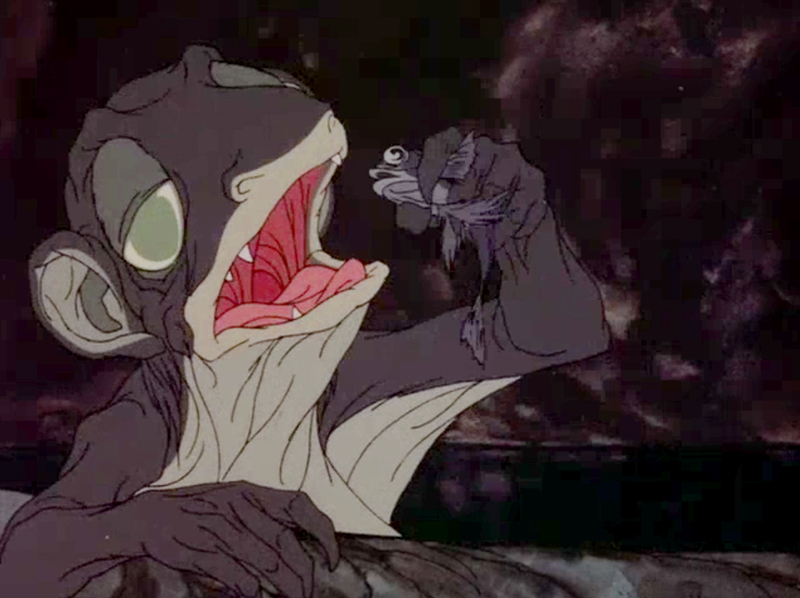 Although the concept work for the film was handled by Rankin/Bass in the US the animation chores were handled by Japanese animation studio Topcraft, whose animators would go on to form the hugely successful Studio Ghibli. The film was originally broadcast in the US on 27th November 1977 and was generally well received, with Romeo Muller winning a Peabody Award for his teleplay. 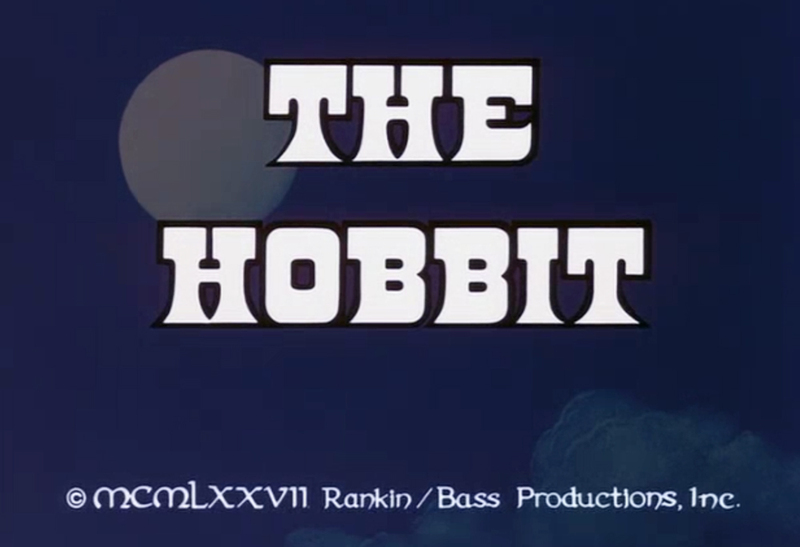 Despite the film being made for TV the film makers utilised some eclectic voice talents: Bilbo was voiced by TV actor Orson Bean (The Phil Silvers Show, The Twilight Zone); Richard Boone (The Robe, Ocean’s 11) played Smaug; monologuist Brother Theodore played Gollum while veteran movie directors John Huston (The Maltese Falcon, The African Queen) and Otto Preminger (The Man with the Golden Arm, Anatomy of a Murder) voiced Gandalf and the Elvenking respectively. 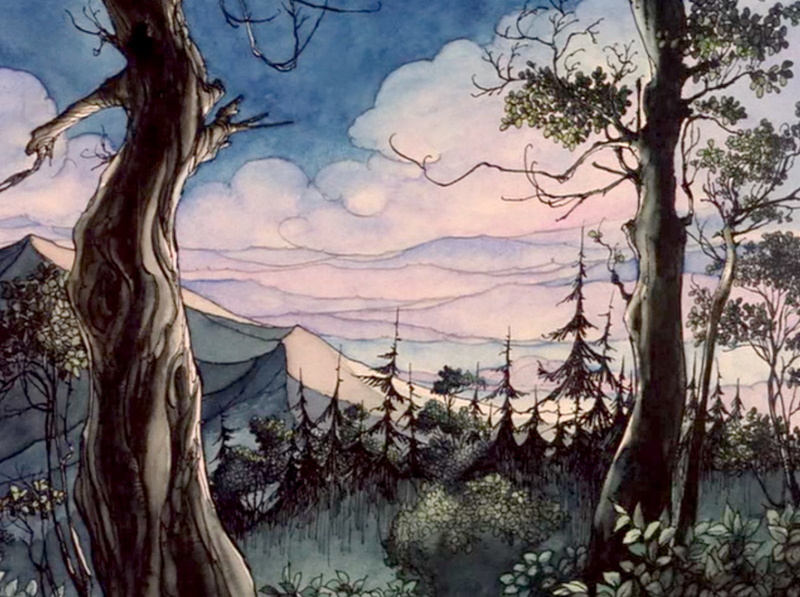 Although produced for a limited budget (around $3m), and aimed at a holiday TV audience, the film is surprisingly accomplished and loyal to the source material, JRR Tolkien’s children’s story originally published in 1937. The design of the characters is reminiscent of Tolkien’s original drawings from the book and features more pen work that you would traditionally see on a TV cartoon, giving the film an illustrative feel while the backgrounds are well painted and detailed. The film is also faithful to the original book, albeit with a somewhat brisker pace due to the film’s run time of only 77 minutes. All of the book’s major events are covered: the group’s rescue from the trolls; the meeting with Elrond at Rivendell; the encounter with the goblins under the Misty Mountains; Bilbo’s encounter with Gollum; the group’s capture by the spiders in Mirkwood; escape from the wood-elves; Bilbo’s encounter with Smaug; the dragon’s death at the hands of Bard; the Battle of the Five Armies and Bilbo’s return journey home. The only real deviation from the book is the absence of the shape-changer Beorn. Many of the songs from the book are also used in the film, such as ‘Chip the glasses and crack the plates!’, ‘Far over the misty mountains cold’ and ‘Clap! Snap! the black crack!’ to name but a few. Sadly the film is all but forgotten now, sitting deep in the shadow of its big-budget counterpart, which is a shame as it’s an entertaining little movie. Rankin, Bass and Muller clearly had a great deal of respect for the original story and treated the film accordingly. Although created as a Thanksgiving TV entertainment for kids the film doesn’t shy away from the more violent parts of the story: The Battle of the Five Armies may not be shown in graphic detail but its consequences – and Bilbo’s disgust with war – are clearly apparent. I also like how the film represents Gollum, who is depicted as being far more alien and amphibious – and far less sympathetic – than he is in the Jackson films. I suppose the main criticism that could be levelled against the film is its rushed pace. Although most of the book’s events are included they are covered very quickly – the scene with Elrond at Rivendell, for example, is two minutes in length while the Battle of the Five Armies barely takes up five minutes. And the film’s fast pace doesn’t allow for much character development. Still, I enjoyed the film, brisk pace and all (if I was being churlish I could argue that since Peter Jackson’s new three-part Hobbit adaptation promises to clock in at bum-numbing 10+ hours the quick pace of the 1977 version comes as a welcome change). And it’s a pity the 1977 version has been so neglected over the years as its status as the first movie adaption of Tolkien’s work merits special attention. Although the film is available on DVD in the States there are technical problems with the audio quality so buyer’s should be wary – hopefully the success of the new films will prompt a new remastered release of the original. 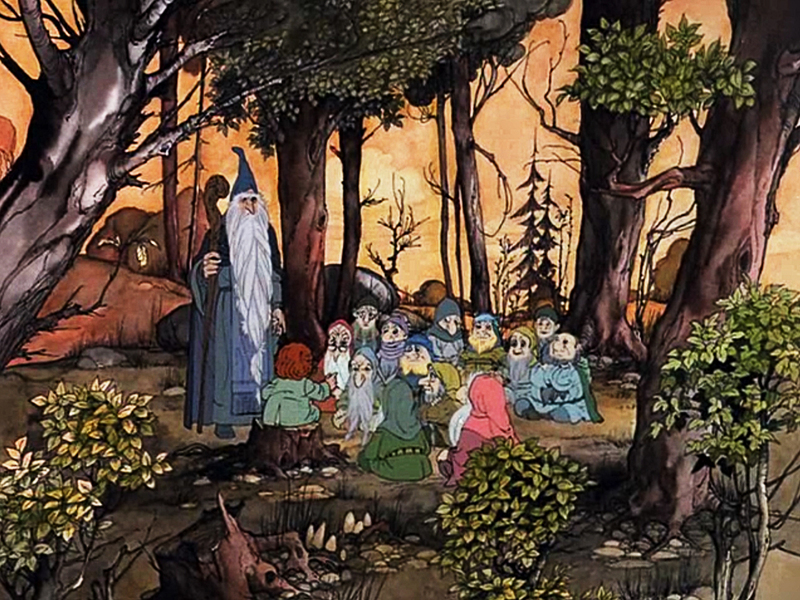 The Rankin/Bass team would visit Middle-Earth again for The Return of The King in 1980, however, between that film and The Hobbit came a far more ambitious Tolkien adaption: Ralph Bakshi’s The Lord of the Rings from 1978.